Basecamp Lodge features a variety of King and Queen bedrooms with varying types of; Deluxe, Double King /Queens and Suite rooms. 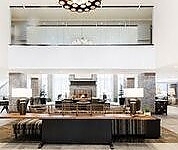 The lodge boasts a log cabin ambiance with a wood-burning fireplace in the lobby lounge, a beautiful cedar sauna and complimentary continental breakfast. 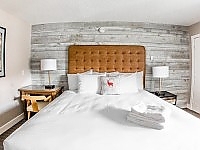 Each room is equipped with locally made bath products from Rocky Mountain Soap Co, Keurig coffee machine with pods, high speed Internet, Telus Optik TV and movie channels. 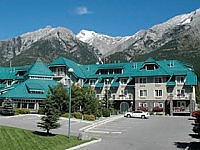 A 50-person conference space with panoramic mountain views of Mount Lady Macdonald and Grotto Mountain. Conveniently located within walking distance to Main Street. Basecamp Resorts is your home away from home with all the amenities you could need. Each suite comes with a fully equipped kitchen, washer and dryer, living room, dining area, linens and towels, a shared roof top hot tub and BBQ areas. Located close to the shops and restaurants on Main Street, this hotel boasts a choice of multiple bedroom suites from a micro, 1 bedroom, 2 bedroom, 3 bedroom or adjoining 5 or 6 bedroom suites! 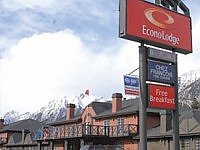 Nestled in the heart of the Canadian Rockies, we welcome you to your next great adventure. 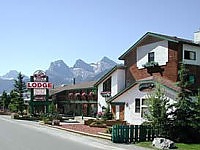 Surrounded by spectacular mountain views, and the hotel's close proximity to many attractions and activities, make it the perfect location for your getaway! Bike scenic trails, hike or horseback ride through breathtaking vistas and even golf in some of the most beautiful backdrops in the world. In the winter, enjoy world class downhill and cross country skiing, snowshoeing, dog sledding and ice climbing. Located in the Historic Hamlet of Dead Man's Flats, the Copperstone Resort is the perfect family destination to rejuvenate and relax in perfect luxury. 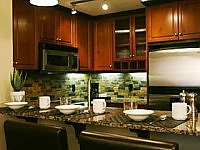 Each modern suite features a fully equipped kitchen with granite countertops, stainless steel appliances, fireplace, flat screen TV's and private bedroom. Get a great night's rest after a busy day in the Rockies tucked into our custom pillow top beds and fluffy duvet comforters. Located at the base of Mt. 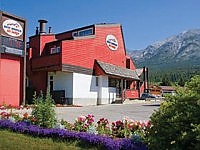 Lady Macdonald at the entrance to Cougar Canyon, this new 12 room Inn offers affordable and relaxed mountain comfort. 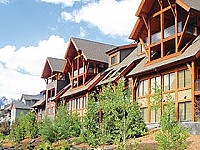 Timberframe style suites and lofts with slate and river rock fireplaces. Offering endless panoramic mountain views. 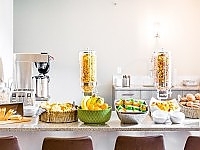 All rates include Creekside's Rocky Mountain breakfast each morning. Relax in front of the fire, have a steam and private massage or simply play in the games room and exercise area. Pets are welcome in this non-smoking environment. 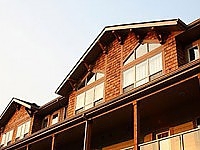 The Drake Inn is located at the entrance to Main Street and all rooms provide outstanding views at a great value to small groups, families, weddings and independent travelers. Your stay includes complimentary wireless internet and 10% off meals in our onsite pub and restaurant. 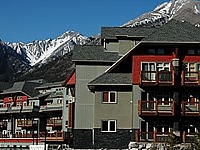 Your choice of single queen, double queen and our most popular creek side rooms allow you to stay comfortably and economically in the heart of downtown Canmore. 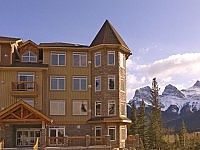 Warm up to Canmore at Fire Mountain Lodge - Canmore's hottest new boutique luxury resort. Fire Mountain Lodge is the perfect place for an escape with good friends or a romantic retreat. 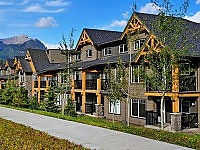 This warm and inviting 24-suite, 2 and 3 Bedroom luxury condo-resort offers its guests a stylish alternative to traditional Canmore accommodations and everything you need to kick back and enjoy the stunning mountain views. 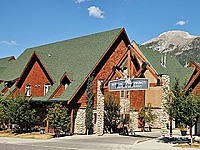 Lamphouse Hotel is Canmore’s newest boutique hotel. It features a variety of King and Queen bedrooms with varying types of; Deluxe, Suite and Double Queen rooms. These modern rooms showcase barn board features walls, unique artwork, 55” inch flat screen TV’s, Nespresso coffee machines, mini bar snacks, locally sourced amenities from Rocky Mountain Soap Co., high speed internet, Stearns and Foster top of the line mattresses , breakfast in a crate and local artisan baked goods delivered to your room every morning. Mountain and Creek side views! We are located on Main Street! 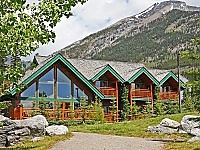 Canmore's only true boutique resort has a passion for delivering on what so many properties only promise! Mystic Springs is the perfect destination for active families and couples, with year-round outdoor hot pools, massage, spacious 2-Bedroom luxury Chalets with all the comforts of home, and the best of genuine mountain hospitality. It's no wonder that this resort has won so many fans. Mystic Springs has specific rooms designated for pets so don't forget to bring your dog! 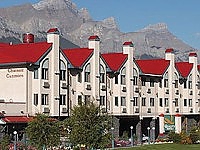 Chateau Canmore is an All Suite Resort that exudes rustic charm with sophistication. We also serve as a great meeting location; whether it's for a business conference or a wedding, let us customize a package for you. Amenities include a Spa/Fitness Centre which features full massage and therapeutic treatments and excellent dining facilities. 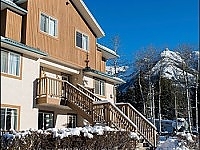 Welcoming, Clean and Customer Service-Oriented, the Rocky Mountain Ski Lodge offers a variety of accommodation options from standard rooms to studio and apartment condominiums with fully-equipped kitchens and gas fireplaces. 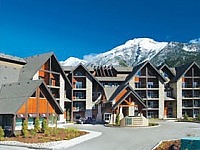 Mountain Zen at Silver Creek Lodge is Canmore, Alberta's most luxurious hotel accommodation. Subtle, beautiful an experience to be remembered. 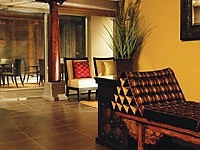 Located at Silver Creek Lodge is the Bodhi Tree Spa with three unique out door hot pools, the ultimate in relaxation and ambience. Dine at the Wild Orchid Asian Bistro & Lounge, an amazing Asian fusion culinary experience. All our luxury rooms are equipped with 1 King or 1 Queen Bed, Fireplace, Soaker Tub & Shower, Full Kitchen, Pull out Sofa Bed. 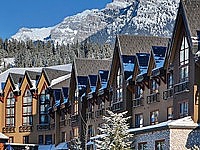 Enjoy a getaway in the Rocky Mountains. The in-suite decor at Solara sets the bar for luxury interiors in Canmore. Leather furniture, brand-name appliances and cork flooring create an overall sumptuous feeling with a cozy underlay. Think only of yourself, feel at home and be rejuvenated. After a hard day on the slopes, hiking the trails or golfing, plunge into our comfortable beds for a night of well-deserved relaxation. 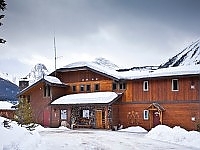 Spring Creek: a unique mountain village in the very heart of downtown Canmore. 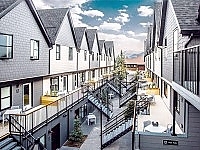 Surrounded by two mountain streams, with tranquil streamside pathways that lead you into the downtown core where an array of mountain cuisine and eclectic shopping awaits. 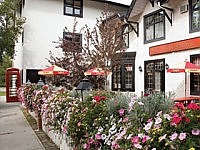 Canmore boasts some of the finest restaurants and cafes in western Canada, and Spring Creek provides the perfect starting point for your culinary adventures. Want to relax and enjoy a BBQ on your private deck instead? No problem. With magnificent views of the snow-capped Rockies surrounding you, and with a luxuriously appointed mountain lodge style suite – why not kick back and enjoy your private oasis? 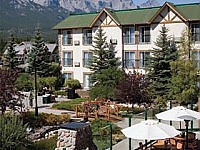 Find the luxurious getaway you've been looking for at Stoneridge Mountain Resort, located in the majestic Canadian Rockies of Canmore, Alberta. 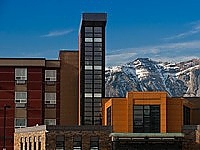 Our modern, all-suite property lies just moments from downtown shopping and dining, scenic golf courses and Banff National Park – home to glaciers, hot springs, campsites and three major ski resorts.